Gadgets · News · Whats Hot! Google’s latest device to make the life of its fans more entertaining has finally arrived in India with e-commerce websites listing the tiny device that connects an HDTV to a smartphone, tablet or a laptop. 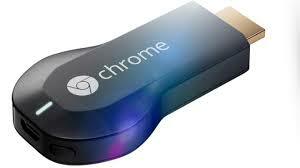 Google’s Chromecast has been seen list on India’s major online retailers – Amazon and eBay. The Google Chromecast is available for Rs 3,045 on Amazon.in whereas the tiny 2-inch connecting device can be bought for Rs 3.379 from eBay.in. Google loves to surprise people with its ground breaking models but they top the chart by often putting small price tag on their products. The company launched Chrome cast on July 24 stating that it will change the way we watch TV. Well, it may not be entirely correct but there may be some truth to it. Chromecast is a small dongle size device that lets you connect your HDTV to internet. As it’s a Google Inc. product, Chromecast gives you full access to your chrome pages, play store and off course YouTube.. It works with various devices like Laptops, Anroid smartphones and tablets, iPhone, iPad , Mac and Windows gadgets via chrome. Once you connect Chromecast to your device with a cord you can operate its functions from your Smartphone, Tablet or PC. The introductory model also includes free Netflix subscription for 3 months. However Chromecast is not the first device of its kind, Apple TV, roku, X-box and many media players preexist in the market. But they are neither small on price nor on size which makes Chrome cast stand out among others. Infect after launching the model the response was so overwhelming that Google sold out their introductory Chromecast models within few hours. You can order Chromecast for $35 directly from Google store or other retailers to book yours. Currently Chromecast is restricted to limited apps and media support but we hope to see additions and updates in near future.